The audience is assembled and the curtain rises. On the little stage of the puppet theatre is… another even smaller puppet theatre! We watch as an old man plays accordion, a young boy taps out a jig and plays a whistle. Then they (and we) settle down to watch a miniature Punch and Judy show! This is followed by shadow puppets dancing in the light, by glowing mushrooms popping up onstage, by a beautiful sea princess swimming in the waves with a sea witch, by an arrogant wind trying to blow out the moon. And afterwards, when the audience have gone, we get to go backstage and play a little, meet the puppets, and their operators, watch the whole thing being made ready for the next performance. 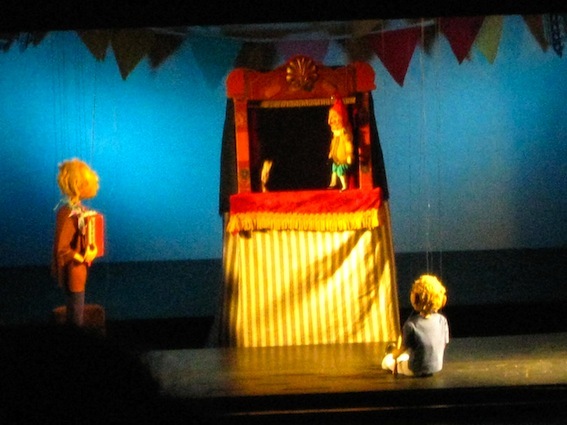 Above our heads one puppeteer is teaching his three year old how to move the strings. Every time he tells his little boy it’s time to go, the child starts to cry and say ‘more’. If you like puppets you might like the previous blog, Strings and Things; watch out for another puppet-related bog next week, when we meet the Giant. This entry was posted in Marie-Louise Fitzpatrick, Michael Emberley and tagged Missfitz Marionettes, The Puppet Theatre Barge by The Belugas are Watching. Bookmark the permalink. The puppets are really lovely. Thank you for sharing this.